I was sitting here earlier thinking what I could do a post on today and I kept getting this nudge to do something on a candy cane, so I started looking up the meaning of the word candy cane and I found this and thought it was exactly what we all need this time of year. Many years ago a candy maker wanted to make a candy at Christmas time that would serve as a witness to his Christian Faith. He wanted to incorporate several symbols for the birth, the ministry and the death of Jesus. He made the candy hard to symbolize that Jesus is the solid rock and the foundation of the church. The firmness also represents the promises of God. The candy maker made the candy in the form of a J to represent the name of Jesus who came to earth as our Savior. He thought it could also represent the staff of Jesus, the Good Sheperd. I hope that you all remember the true meaning of Christmas this year and all the years to come. JESUS is the reason for all the SEASONS! I love this story. 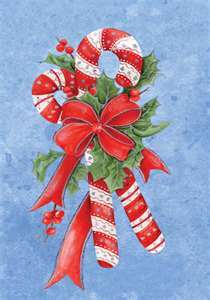 I always knew there was some meaning behind the candy cane, but had never heard the story. It makes me want to put more candy canes through the house. Love you Amy; Can't wait to see you on Tuesday.